BOSTON -- In death, Aaron Hernandez may not be a guilty man in the eyes of the law. 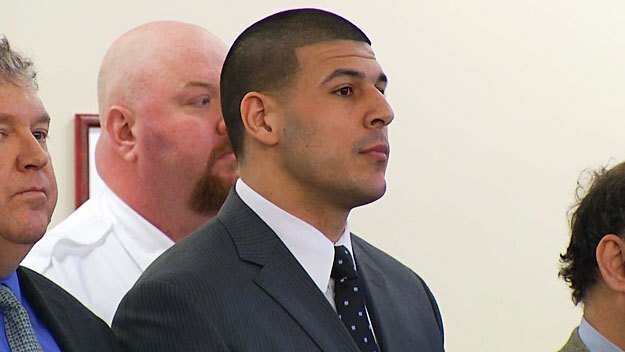 Hernandez, a former NFL star, was convicted and sentenced to life in prison for the 2013 murder of Odin Lloyd, a semi-professional football player who was dating the sister of Hernandez’s finance. Massachusetts prison officials said Hernandez was found hanging in his prison cell in an apparent suicide early Wednesday. His death came less than a week after he acquitted of murder charges in the shooting deaths of two men in Boston in 2012. Because his appeal in the Lloyd case was still pending, Hernandez’s attorneys can move to have that conviction erased, said Martin Healy, chief legal counsel for the Massachusetts Bar Association. The principle can also have a major impact on civil cases. If Hernandez’ conviction in the Lloyd case is tossed, no evidence presented during Hernandez’ criminal trial can be presented in civil court, and a lawyer suing the estate will not be able to reference the conviction, Healy told MassLive.com. Lloyd’s family had already filed a wrongful death lawsuit against Hernandez. Lloyd’s family attorney announced Wednesday that they will continue pursuing the wrongful death suit despite Hernandez’ death. “Odin Lloyd was a provider. He cared very much for his mother and the household and did many things to keep it going,” attorney Doug Sheff told CBS Boston. Hernandez’ death is also likely to affect civil suits expected to be filed by the by the families of the victims in the most recent case, in which Hernandez was acquitted. Attorney William Kennedy represents the estate of Safiro Furtado and the family of Daniel de Abreu in wrongful-death lawsuits against Hernandez. He said despite Hernandez’s acquittal in criminal court last week, the families still plan to try to hold Hernandez accountable for the killings in civil court. Kennedy says the lawsuits will go forward, but will now be against Hernandez’s estate. “I think they might have rather had Aaron Hernandez in the courtroom during the civil suit, being able to go after him in person, as well as by deposition, if they could,” Klieman said. Kennedy says the families of Furtado and de Abreu “understand what kind of loss” Hernandez’s family is dealing with now. He said the relatives “don’t take any joy” in Hernandez’s apparent suicide, even though they believe he was responsible for their deaths.